In the Fairy Garden, children use birch bark, moss, stones and other foraged materials to build fairy houses, forts and miniature gardens. The Outdoor Classroom and Amphitheater is a relaxing place to experience the woods and to view the boardwalk bridge crossing the open meadow below. It's an inspiring site for classes, lectures and performances. 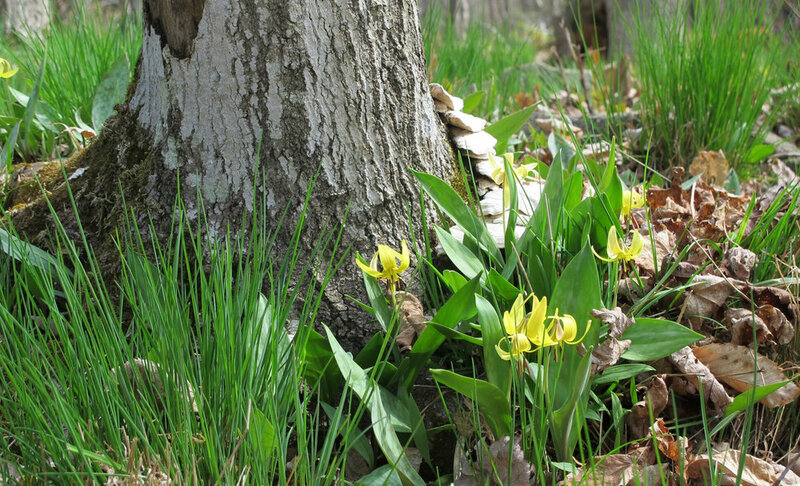 Woodland Wildflowers like trilliums, Jack-in-the-pulpit and trout-lily bloom in April here, before the canopy trees leaf out. Shade-loving summer and autumn wildflowers continue the show. For more, read Beginner’s Guide to Spring Wildflowers in the Woodland Walk. By late June, the Mountain Laurel Collection--the native species Kalmia latifolia and a variety of cultivars--explode in spectacular bloom. Saving Native Trees. Mountain Top Arboretum works with Cornell University to save the Woodland Walk’s stand of 150 white ash, Fraxinus americana, from the devastation of emerald ash borer. Preserving these soaring leafy giants for enjoyment and study is an important Arboretum goal. The Woodland Walk also features the American chestnut, Castanea dentata, taken from various chestnut stock and breeders’ selections. These trees will interbreed with blight-resistant chestnuts, and there is hope that seeds produced will develop an American chestnut that is both blight-resistant and well adapted to this region.